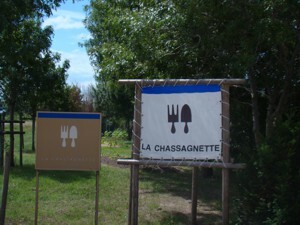 So here I am at La Chassagnette, renowned restaurant in the Camargue, famed for its 4 acres of vegetable gardens, all under the watchful eye of Chef Armand Arnal. And it is here that I found my vegetable Niravna. Now strictly speaking I have strayed from Provence, and will continue to do so but will always remain within reach so for the purists out there, fear not, I have not forsaken you. The sign that reveals itself at the last second. To begin; coming from Arles follow the signs to Le Sambuc. Approach slowly, the sign to the restaurant is visible at the last minute, so if you have a large 4x4 on your tail as I did, a sudden left turn can be fatal, for the back end of your car at least! Once you have parked head on towards the restaurant, (the word RESTAURANT is written on a post, you can't miss it). As you approach, and if like me you enjoy a well kept vegetable garden, then you will have probably already left the official path and will be wandering amongst the rows of beans, peas, basil, arthichokes and the list goes on. The garden is immaculate, and all organic as the encroaching, but always held at bay weeds can certify. As I was on an official visit I got to meet the head gardener with whom I talked tomatoes, quinces and basil, and found that he and only three others managed this immense vegetable plot. He was the first person I met and for me first impressions are essential, and I liked this one. First of all he had time for idle chat from a garden idiot like myself. Second, he was clearly passionate about what he did, not just the part about growing nice veg, but you immediately got the sense that he was part of what happened in the kitchen. 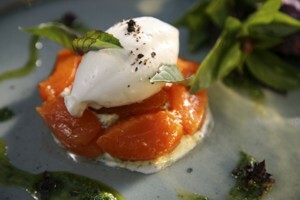 He explained that the choice of what was grown was the Chef's and then he found new and interesting varieties as well. I told him of a friend of mine that he should meet who was specialised in tomatoes and had nearly 20 different varieties. 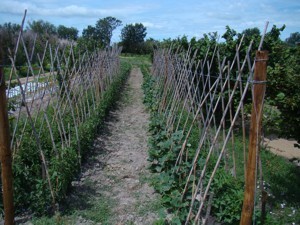 He politely said that he would love to meet him, and then added that he grew over 30 varieties himself. My next encounter was Armand Arnal in person. The fact that he is available is something that I appreciate. and he took the time to listen to my "I am honoured to meet you" and "I have heard so much and have always dreamed of eating here" as well as the standard name drop "xxxx told me about your restaurant and so here I am" with a smile ( a real one) and showed us to the reastaurant area. I could have visited the kitchens, but having worked for long enough in the business I know that in mid service having to stop to acknowledge "the visitor" is rarely welcome, but I am sure they were lovely, clean and full of vegetables awaiting their fate. So now to the serious bit, the food. Well nearly, before the food we were served the house cocktail. It was a fresh fruit juice (strawberries for sure but I confess to having forgotten the rest) with Champagne. Refreshing, not overly alchoholic and quite delicious. a garden in your plate! So now the food. The menu was simple in its length and complex and fascinating in its content. 80% of the food served comes from the gardens, all the other produce is sourced locally, the fish from the Grau du Roi, directly from the boats as they come in, the lamb from nearby St Gilles and the duck from the neigbouring rice fields. The vegetables are the stars here, and the meat or fish is always at the end of the course description, as if it was just an accompaniment, which in a way it is. My dining partner Julie and I made the standard pact of choosing different dishes, and then dipping in to each others plate. If there are four of you, you could order the entire menu. We started with an amuse bouche of beetroot gaspachio with coriander oil and and redcurrents. The cold garnet red soup dotted with the bright green oil, and a borage or star flower in the centre was, like all the dishes to follow admired in length. When I find myself faced with interesting foods such as these I often try to imagine the taste before trying them. Here a sort of cold borscht with a Thai influence was forming in my mind's taste buds. I wasn't miles off, the soup was lighter and more refined than it's Eastern European counterpart, with small cubes of beetroot adding texture and redcurrents providing the occasional pop of acidity setting off the discreet sweetness of the soup. The coriander oil gave it a soupçon of eastern promise, without overpowering the dish as coriander can so often do. The Asian influence continued with my starter. Green beans and sweet and sour pomelo with a gravlax of duck (the one from the local rice fields) which I think had the salt replaced with a light soy sauce for the marinade. Julie chose the cherries marinated in ginger and sesame with grilled filets of red mullet. 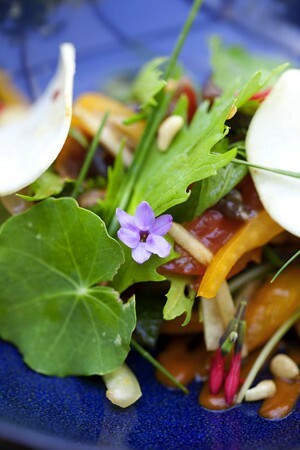 Both dishes were garnished with a variety of leaves and flowers from the garden. We followed this with me going for the fennel and cuttlefish, and herb garnish with a perfectly poached filet of "Denti" which is Common Dentex in English, a name that inspires toothpaste, so I would stick to "a member of the Sea Bream familly" which is what it is. All of the above was served with a rock fish bouillon. Julie chose the all vegetarian course of courgette cannelloni, accompanied by mixed green vegetables and a mint pesto. There were two meat dishes to choose from, beetroot and chard with red sage and roast pigeon, or an okonomiaki (a type of Japanese pancake usually made with cabbage leaves as the main ingrediant) of black cabage, charlotte potatoes and spring onions and nuggets of sautéed local lamb in theur own jus. Just a quick word on the drinks to accompany all this wonderful gourmet vegetableness. 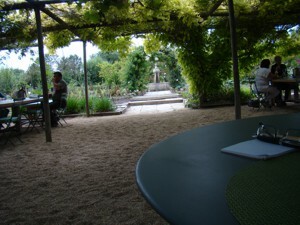 An extensive wine list is of course available, with a good supply of local offerings as one would expect. Armand Arnal's fascination with Japan provides a somewhat original touch with a selection of Sakés to accompany your meal if you choose. If like myself you are not an afficianado of the Saké world, he has a option for a different Saké for each course chosen for you. If water is all you require, then enjoy the house's own water from their spring, avec ou sans gaz. Now to the desserts. Four were on offer, pan fried cherries with honey suckle and sorrel creme brulée, a light cake made from rhubarb and Mara des bois (a French variety of strawberry combining the taste of woodland strawberries and the body of its cultivated cousins) served with an elderberry sorbet, a confit of fennel with citrus fruit and a cream cheese sorbet and a pea soufflé with a "hierba buena" sorbet. I went for the soufflé and Julie for the fennel. We purposly chose what seemed to be the least classic options, and I must admit I was intrigued by the magnificent apparition of my green soufflé. With the first spoonful I tasted only meringue, and then slowly at first and gradually becoming more and more apparent the taste of peas, reminicent of my chidhood pilferings in the family garden, came through. It seemed that the pea flavour got stronger as you approached the centre of the soufflé, and since I started on the side it worked beautifully. This was set off with the "hierba buena" sorbet. Hierba Buena or litterally Good Herb is a name given to a wide variety of mint plants found in the Americas. This particular one was a minty citric combo. Julie's confit of fennel reminded me a little of licourice and together with the citrus fruit it offered a delightful fresh finish to this culinary voyage of discovery through Chef Armand Arnal's organic vegetable garden and his seemingly unending imagination.